Google Search - Did they add secret sauce again? Just posted an item from a colleague in New Zealand about radio after the earthquake. Did a search about 30 seconds later to see if Beachbreak FM near Christchurch had a website. It didn't, but my search did reveal my blogpost was already number 2 in the Google ranking. Not sure what to think. Suppose the posting had been a mistake? This is maybe a case of things being too fast. 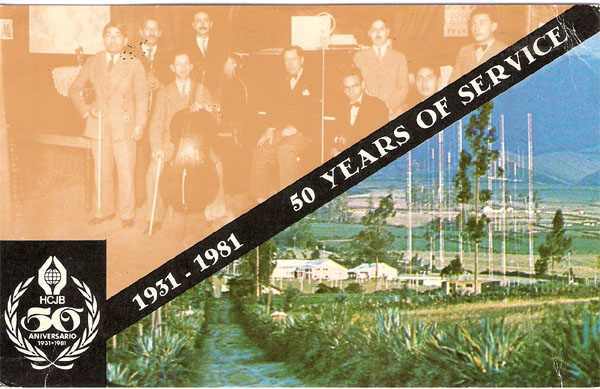 More status reports from David Ricquish of the Radio Heritage Foundation in New Zealand. Low power local FM community radio stations in Christchurch are struggling to stay on the air and serve their local neighbourhoods with emergency and welfare support. The Eastern suburbs have already lost one local FM station. Johnny Miller, operator of One-Eyed 107.1 FM in Hampshire Street, Aranui tells us his equipment is damaged beyond repair and his studio and house now uninhabitable. He doesn't know if his local community station can ever return to the air. Beachbreak FM located at South New Brighton School is reported off the air because there is no power and their antenna hadn't been fixed since falling in the September 4 earthquake. However, if they can get a generator and help fixing up an antenna, they may be able to get the station broadcasting to the Brighton area and into Redcliffs and Sumner with local messages and information. The status of Burwood Community Radio 88.2 FM about 1km away from QEII Park is unknown as is the status of The Wave 88.3 FM located at the All Saints Church in Sumner. 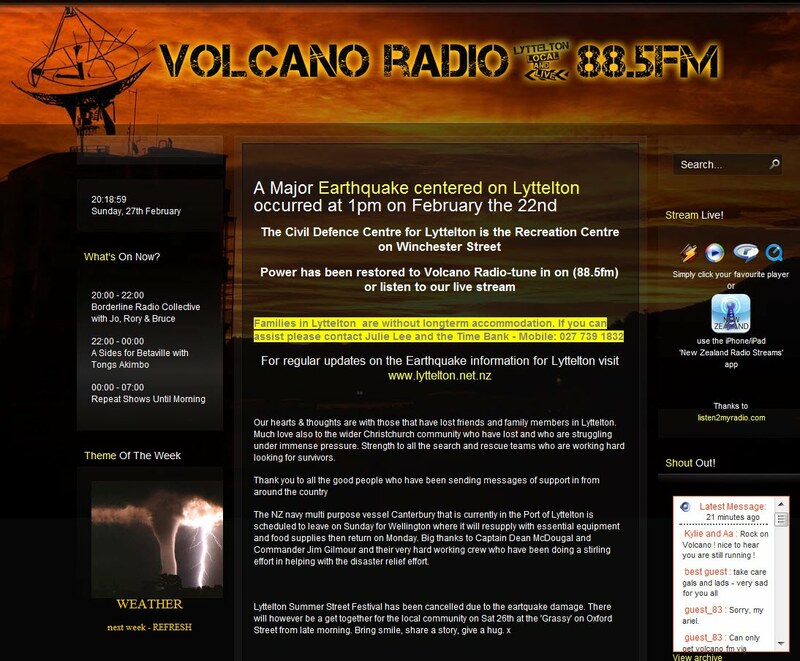 The brightest news comes from the earthquake epicentre Lyttelton, where local Volcano Radio 88.5 FM was able to return to the air with local messages and upbeat music within a few hours and continues with regular local updates. In the St Albans & Mairehau area, Power Hits FM 87.8 kept broadcasting with a generator and now has full power and its signal reaches into parts of the eastern suburbs. Nearby, Oak FM 107.7 at St Albans School remains silent. The studios are in a two story school building and until its cleared by engineers can't be used. It has full power and could be activated immediately to provide welfare and community announcements for the area. The current status of Rapid FM 88.1 at Waimairi School is unknown and Radio Redwood 87.9 FM is on the air but with automated programming. Whilst major radio networks are covering the city with AM and FM signals, their own local studios are within the CBD cordon and their broad coverage generally isn't local neighbourhood or suburb based. Local community access radio Plains FM 96.9 is currently silent. Reports from the Eastern suburbs indicate a news and information void as power remains off with no TV or Internet coverage and limited mobile coverage. be mailed to the Radio Heritage Foundation, PO Box 20024, Newtown, Wellington 6242. Donations are tax deductible in New Zealand. From David Ricquish, longtime Media Network listener in NZ earlier today (Wednesday). Studios of every major radio station in Christchurch are badly damaged and not accessible as buildings are unsafe and now inside an evacuated Central Business District. One AM radio mast is unstable and silent. Journalists have died in The Press newspaper building which has collapsed. Power is out to 70% of the city. Cellphone towers are down, batteries finished in most of those still standing. Crowdsourcing is giving fast unverifiable content. Magnitude 4-5 aftershocks roll across the city at roughly 20 minute intervals. Urban S&R teams are on the ground from Australia, large contingent enroute from Los Angeles, others flying from Japan & Taiwan. Singaporean military forces are on the ground helping. A national emergency has now been declared. Impressed by the Google crisis response pages and the Ushahidi maps. I wonder if the broadcasters there have been using them like ABC did in Brisbane? was narrated from the island of Barbados in the sunny Caribbean. It contains quite a lot off off-air recordings made by plugging a Sony ICF2010 into the professional Walkman WDM6 that I used to carry everywhere (and still own, although there are better recorders now with Flash memory). I think this programme is a good example of armchair radio listening, taking you to places on the dial you wouldn't normally visit. Its pure theatre of the mind. I just love those long URL's. Forgive us. 15 years ago, URL's were still new to us. Keep telling my broadcast clients they should say thank you to their viewers and listeners for their loyalty. `it always works, if it is genuine. This variation on an old theme by Porsche is cool. As part of a campaign to get 1 million Likes on its Facebook page, Porsche put around 27000 names of its fans onto a GT3 R Hybrid making these people part of the Porsche success. Very clever. So what next? Will Porsche ask the 27,000 people mentioned on the bodywork for ideas on which charity should benefit when they auction it off? There seems so many things they could do. Thanks to Leo of Marketing Facts for the tip this morning. Warner Bros wants to get directly to the consumer and bypass the iTunes store. But I am not sure that people will want to buy a new app for every film. Yes, the making of looks great on the iPad, but it very dependent on the film. I'd like to see more on Batman or Hot Fuzz. But for 95% of the movies I see, I would want to see it first in Blu-Ray quality to judge if I want the extras. This must cost a fortune to make like this - only a handful of movies are going to make this worthwhile. If your bandwidth is capped, as it is in some countries, this is going to be a problem. Many UK and US formats that have been adapted for the Dutch TV market have failed miserably. Qi in Holland was just awful - the host, Arthur Japin, had a fraction of the knowledge and wit of Stephen Fry and those taking part were clearly trying to show-off what they knew...no that's not the way it works. Have I Got News for You was also a disaster. So when I saw a poster on the side of the A1 motorway saying that Comedy Central was bringing The Daily Show to the Netherlands for 3 weeks, I must admit to being skeptical. This was especially because the designated host had been involved with the Have I got News for You version in the Netherlands which bombed so badly. The series has just been and gone. I'm glad they also released them on the web as they happened. And the verdict? Actually, Jan Jaap van der Wal and a team of writers have ended up writing 12 very good shows indeed. Funny. Very critical. But also fair. As good as John Stewart? Yes, I think so. It works because Jan Jaap is laughing with the audience, not at them. Their commentary on the failing of Dutch and commercial broadcasters should get others thinking. The format is the same; they have clearly learned a lot from the timing and pace of the US show, but Jan Jaap adds a nice Dutch flavour to it all. It is adapted from the original, but it is not a copy. It is written for a different culture. So congrats to co-writers Owen Schumacher, Merijn Scholten, Sander van Opzeeland, Peter Pannekoek and Niels van der Laan. Daniel Arends, Kees van Amstel and Bas Hoeflaak were also good as sidekicks. The danger is that they try and make the show daily and that they can't write fast enough to keep up the standard they have achieved. Learn from other countries that build series of programmes (13 episodes) and then go dark to write some more. Build it slowly and it will blow the others away. Great that Comedy Central in The Netherlands was willing to take the risk. OK, it is a marathon video session, but it's actually the story of the rise and fall of shortwave broadcasting and the strategies the US is now employing. I think the BBC World Service is adopting the same strategy, but the BBG actually explains it a lot better. Ken Burman (1'hr 24 minutes) in talking about anti-blocking software is fascinating. I am sure the BBG needs to do a lot more work to figure out the new ways of story-telling on the emerging platforms. But I am in no doubt that this is the way forward. Data is the new oil. That's why the race is on to speed up the financial markets, to a point where I wonder who is still in control. On Friday 18th February, the joint advisory committee of the Securities and Exchange Commission and the Commodity Futures Trading Commission recommended that the SEC consider new incentives or rules that would restrain market strategies commonly used by high-speed trading firms. About time. This joint committee was established a few days after a major technical meltdown back on May 6 2010. It was the second largest point swing, 1,010.14 points and the biggest one-day point decline, 998.5 points, in Dow Jones Industrial Average history. It sent the Dow Jones industrial average plummeting nearly 1,000 points in less than a half-hour. Now, after several months of investigation by the SEC and the CFTC, they seem to have determined that the so-called "flash crash" occurred when a trading firm let loose a computerized selling program in an already stressed market. According to AP, the firm's trade, worth US $4.1 billion, led to a chain of events that ended with market players swiftly pulling their money from the stock market, the agencies' review found. Compare that with the news that the world’s financial markets took another big step last Tuesday with the announcement that NYSE Euronext and Deutsche Borse are merging. As the Muckety Map above shows (Click the tools on the left hand side if you really want to play with the map full screen!) the US$10 billion stock deal comes on the heels of a similar deal announced two weeks ago between the London and Toronto stock exchanges. Four months ago, the Singapore stock exchange said it would buy the Australia exchange. Remember that 2007 merger between the NYSE Group and Euronext? Euronext had previously acquired exchanges in Lisbon, Paris, Brussels and Amsterdam, as well as the London International Financial Futures & Options Exchange. So as more and more of the exchanges get interlinked, and seem to be trading at ridiculously high speeds, to what extent are humans (especially the regulators and small investors) still any part of the equation? High Frequency Trading is becoming very difficult to regulate. Based on the number of shares traded a day that means we're seeing on average 6,944.444 shares being traded a minute or 115,740,74 shares per second. Personally, I am concerned that this is the makings of the next world economic meltdown. Suppose these connections go down again, surely the impact will now be even worse? This article increased my fears rather than reduced them. This is the next James Bond plot! Thanks to hofste.com for the background research. 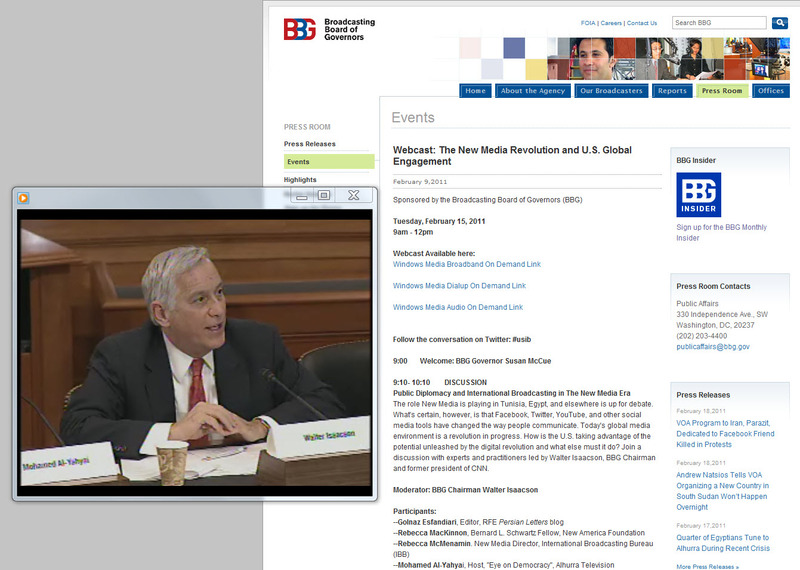 I think many NGO's are far more influential than broadcasters now in not just talking but doing. They have a plan. Many broadcasters are like a broken pencil. No point. I have not really been a fan of LG so far. Bought a phone a few years back and although it has great software and features, it was mechanically poorly constructed and fell apart in my pocket. Now, introducing the LG Optimus Pad designed to be a direct competitor to the Apple iPad. Sleek stuff. Curious to see how Apple is going to react with their iPad2. One point that surprises me is the fact that this iPad seems to have two cameras in it for 3D capture..if I understand the trailer completely. For the moment I am going to wait and see. And take good note of the what the telecom guys add to the plan. The Motorola iPad likker called the 'Xoom' is still supposed to be launched in the US in a few weeks time on 24th February. Rumoured to cost 800 US dollars, look at the details of the 3G/Wifi plan. There were rumours that you had to buy a 3G plan in order to switch the wifi on! If true, its bonkers. So Xoom is off my shopping list from the start and I don't believe they are going to make the Feb 24th deadline. And the LG ...it is so fresh at Mobile World Congress that I need time to take it all in. It will live of die by the strength of the apps, not just the beauty of the hardware. LG still win the prizes for rebranding. Remember when LG meant Lucky Goldstar and it was a plastics brand that also made toothpaste? I am sure that LG hope you don't. Just found a bit of nostalgia in a cassette box. 1995 expedition to Quito South America. Amazing how history repeats itself in international broadcasting. At the start of December 1995 we reported that BBC World Service has to cut back by 5.5 million pounds in 1996. Interview with Caroline Thompson, then with the BBC WS management. 10 languages were threatened at that time. BBC has also been testing a mediumwave transmitter in Slovakia. We also reported from a field to the East of Quito in the antenna farm of HCJB. Jonathan Marks attended a conference of local broadcasters in Ecuador and took a side trip to meet those behind a station he'd heard in Europe from the early 1970's. They were also testing a 26 MHz antenna. There are two weather problems - either winds or lack of rain. HCJB also build 100 kW shortwave transmitters as well as small FM transmitters. The sound file is in the vintage vault. Three and half hours of vintage Media Network. I think the BBC World Service is a wounded tiger.. It has been forced to refocus faster than planned, but that shift towards video was inevitable. Shortwave audiences are plummeting and with oil at over 100 dollars a barrel (and destined to go higher if Saudi Arabia goes the way of Egypt) it becomes purely a medium for last resort. The BBC said last month that the cutbacks would mean the loss of 30 million listeners to its service. But the closure of the 5 language services only accounts for a tenth that loss. I asked the BBC Press Office for clarification on where the rest came from. They came back with this retort. Alongside service closures, there are also closures of complete platforms and cuts in our distribution. Here's the press release which gives full details. The headlines of the audience losses are that we estimate an 11 million loss through cutting shortwave distribution of our Hindi broadcasts; 5.7 million in cutting shortwave distribution of our Arabic broadcasts; 4.5 million loss in cutting medium wave distribution of our Swahili broadcasts; and 1.7 million in cutting shortwave distribution of our Indonesian broadcast. I can confirm that we estimate a 3.4 million loss in audiences from the five services we are closing completely - Albanian, English for the Caribbean, Macedonian, Portuguese for Africa, and Serbian. That should add up to 26.3 million. The other 3.7 million of our estimate is spread around the other platform closures outlined in the release. Bearing in mind the population of these areas, the shortwave audience turns out to be tiny. That comment about Swahili being on medium wave is nonsense..never been on mediumwave. I think they really mean Arabic, and that seems to be unaffected. SW makes perfect sense to areas as a medium of last resort - Somalia, Burma, Eritrea, Ethiopia- about 8 countries in the world. But elsewhere, keeping transmitters on the air in case the government cuts the Internet has become a luxury few can afford. And in areas like the Middle East, they were never great shortwave listeners to start with. Al Jazeera has done pretty well without making any radio or using HF. Shortwave for Arabic only really makes sense for the camps in Dafur, Sudan. The BBC WS still has 26 language services and will regroup to fight another battle. It will become stronger if its funding allows it to become a true cross-media broadcaster. And that means using the best mix of media to reach the countries chosen. What's the message, what is the audience using, then select the platform mix. This programme from the archives looks at Kerbango, the Internet radio that (with hindight) never was.At the last count there were three devices promised on the world market to allow you to listen to internet audio on a separate stand alone device. 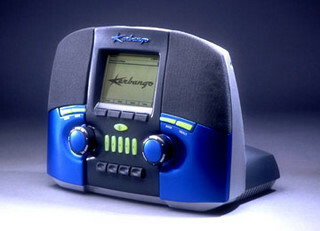 A few days ago (in Feb 2000), a California based company, calling itself Kerbango, showed the prototype of a special radio to be launched in a few months and which is styled a bit like a valve radio of the 1950’s. We asked Marc Auerbach, who’s Vice President of Marketing, why their approach is different. Clement Stokes of Springfield,Durban in South Africa is a regular listener to this programme via the relay on SAFM on their domestic service. Two weeks ago he heard us mention that today we’d be testing one of the new Worldspace receivers. He is particularly curious because he sees the radio advertised in a hi-fi shop not far from his house, although he points out only one South African broadcaster is so far participating in the scheme. The question is simple, does the performance justify the price of more than US $300 . So we explain our findings on the Hitachi KH-WS1, one of four radios on the market in Southern and West Africa designed to pick up the proprietary Worldspace radio system. I still have the radio on my window sill, but the Worldspace feed is dead. Rather expensive FM radio!. Clever ad. Way over priced product...that's always been Motorola's problem. But their point about Apple is so true. Thought the comments were kinda fascinating. Compare the way Loic and Geraldine Le Meur organizes Le Web in Paris with the way IBC organizes their conference and exhibition in Amsterdam. I know which one I prefer. Dec 7-9 2011 at Les Docks. Fraunhofer, the German labs that develop all kinds of coding technology are probably the best known for their MP3 audio encoding system used to squeeze lots of music onto portable music players in the 90's and 00's. They also developed a way to compress the audio onto the now defunct Worldspace satellite system. So what are they up to now? It seems from this interview on the Fraunhofer stand at the recent IBC in Amsterdam that they are putting video and text into low bandwidth audio transmission systems. With recent announcements in late January that the BBC and DW are going to drastically reduce the use of shortwave, DRM looks dead in the water. But the technology here would easily work on other platforms - think mobile or new variations on wifi like Wildnet. The best advice at LIFT11 for those using social media for change did not come from the marketing gurus. They came across to me as rather arrogant "broadcasters" simply shouting their way onto Facebook and Twitter. Some are confusing those who amplify messages with those who really influence. Tiffany St James is different. She's advised the UK government in the past on social media strategies and I think she's spotted the clever strategies and rising influencers. This has put the UK far ahead of the other European governments in building conversations or indeed the Obama Administration since the elections. Not sure if the massive cuts will maintain that lead, but I think we should acknowledge the good work done so far. Note that Tiffany's presentation starts 5'28" into this clip which was only roughly top and tailed. 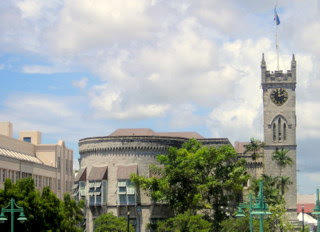 The talk was given on Thursday February 3rd 2011. I worked for a shortwave wireless station for a while and remember that an outburst from the sun could really mess up reception. So it was a delight to see two great talks at LIFT 11 in Geneva which went into great depths about listening to the universe - and explaining why coronal mass ejections are are having a great effect on our global communications, especially as we head towards a sunspot maximum. and take time out to watch Dr Lucie Green put the sun, sunspots and coronal Mass ejections into a very clear perspective. Going through the videos of the Fabulous Lift conference that I was fortunate to attend in Geneva these last few days. They are bit buried on the lift-conference site at the moment. Really liked the work that Marcel Kampman is doing. Had a long talk with Hasan Elahi after his speech at LIFT11 in Geneva. He has an amazing story about how he decided to live in public after being detained by the FBI in Detroit on June 19th 2002 as a suspected terrorist. His challenge was that after it was clear he was nothing of the kind, how could he clear his name when he had not been formally charged. He decided to share (and send) so much data about his movements to the FBI that in fact he overloads them with (useless) data. It reminds me of the way that Western broadcasters would overload jamming systems in former Soviet Union. Give them what they need - and more besides. Bit too cold for a BBQ today. May be in about six months time. It's bitterly cold today as I make my way from my hotel in Alexanderplatz in the former East Germany to the conference centre not far from the Zoo in the bit that used to be the West. In fact the building was put up by the Americans. It was formerly known as the Kongresshalle conference hall, a gift from the US, designed in 1957 by the American architect Hugh Stubbins Jr. as a part of the Interbau exhibition. John F. Kennedy spoke here during his June 1963 visit to West Berlin. I'm here to debate radio's digital future and some of the pathways the non-profit sector could use the spectrum to their own advantage. Impressed by the turnout and the level of discussion, both during the morning and afternoon sessions. Found some members of the audience subscribe to my old Media Network podcasts.